As soil in the Kazakh southern region continues to deteriorate due to the widespread uncontrolled growth of cotton and the effect of the region’s hot weather in reducing available water, Kazakh cotton farmers face a serious dilemma as they must choose to either find new methods to grown cotton, a critical cash crop for export, or cease growing cotton and find a less water-demanding crop to replace it. 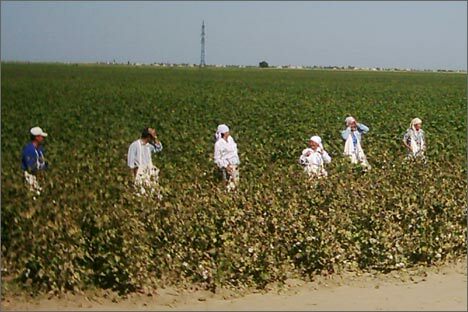 This year will be decisive for the cotton industry survival in southern Kazakhstan, the country’s key cotton producing and exporting region, experts say. In order to stay afloat, farmers are being urged to unite to minimize costs from unexpected losses and switch to more expensive, but efficient, irrigation systems. Despite an unusually hot spring, and government warnings of an anticipated draught, Kazakh farmers planted more than 20 hectares of non-irrigated fields with cotton this year. However, a lack of rain and serious damage from spring hail struck hard, forcing some cotton farmers to re-sow fields. “This is a big setback for us,” says Sadi Bekenov, chairman of one of the largest farmers unions in the South Kazakhstan region. “According to our calculations, we are losing nearly 10 million tenge (USD 83,000) due to re-sowing. No one predicted we would have to do this and had saved a very small amount of seeds. Because of that, we are also running behind schedule,” Bekenov added. Kazakhstan’s cotton industry is in decline due to the ramifications of ineffective cotton farming and harsh weather conditions. As a result, only 162 thousand hectares have been planted for cotton this year instead of the planned 200 thousand hectares. Cotton fields have been steadily enlarged since 1995 and reached 220 thousand hectares in 2004 as cotton remained the only product in the region eligible for export and provided cash incomes to farmers. However, the capacity dropped from 2800 to 2500 kilograms of raw cotton during the Soviet period, and from 2000 to 1900 kilograms during the late 1990s, says Sain Baktybaev, chairman of the Kazakhstan’s Association of cotton growers. He notes that, driven by profit, farmers forgot that growing a single crop without replenishing field nutrients is exhausting the soil and has a very negative influence on future crops. “Development of the cotton industry has been set back due to violations of agricultural rules in cotton planting, poor irrigation systems in small farms and the exhaustion of the soil,” Baktybaev says. A lack of coordinated action also has led to more losses and damage from insects to cotton crops. The government is trying to prevent farmers who grow only cotton from destroying their own land by encouraging them to unite into larger associations. The goal of such groups would be to not only pursue profit, but also manage planting of various crops to balance out possible losses from one crop with profits from another. The state is also encouraging the introduction of water-saving irrigation systems by paying for 80% of total water expenditures for farmers using them. Farmers who continue to use aryks, traditional channels for irrigation in the region, receive only 10% compensation. But small farmers cannot afford expensive drip irrigation systems and banks usually refuse to give credit because the value of rural homes and land does not match the risk on the loan market. This is another reason farmers are encouraged to form large unions. However, things are moving slowly and more than 90 percent of land planted for cotton is still cultivated by small farmers. One of these farmers, Dilmurat Nasyrov, explains that farmers are afraid of losing their land if the union goes bankrupt, which is always a possibility given the low levels of productivity. “If the union is not able to pay the loans back I might lose my land, even if I get 4000 kilograms per hectare. These five hectares are the only thing I have and I make my living thanks to this land,” Nasyrov says. 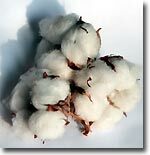 Nevertheless, today’s survival of the Kazakh cotton industry depends on the ability of farmers to unite, experts conclude. Purge the uzbek cotton of the stains of forced child labor!